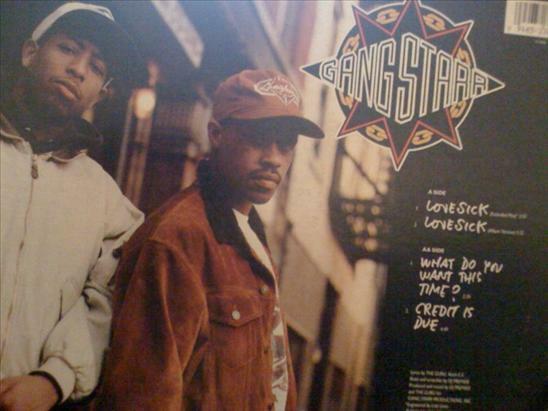 Guru of Gang Starr passed away yesterday. So did part of my childhood. Gang Starr, along with sizable doses of Native Tongue, BDP and Juice Crew music, was my perpetual soundtrack ever since I first peeped the visual for “Words I Manifest” on Video Music Box. There was no better and dependable place to go for that good ol’ NYC boom bap (even if Guru was from Boston and Premier is from Texas) than a Gang Starr record. With that in mind, here is every Gang Starr, and Guru, video in chronological order. Pretty sure the good Dart Adams has this covered already, but so be it. It’s a shame but Jadakiss was right; dead rappers get better promotion. Even GQ notes that he was “underrated.” It’s too bad that only after his death will Guru really get the credit that he is due. RIP Guru. “Just To Get a Rep” – the video was directed by Fab 5 Freddy. people felt a ways when they copped the album and realized the video version had an extra verse. “Who’s Gonna Take the Weight?” – this was “Just to Get a Rep’s” b-side. “Step in the Arena” – See homie with the chain on his neck (no “Just to Get a Rep”) and bald head? That would be Melachi the Nutcracker. “Take It Personal” – “Rap is an art you can’t own no loops, it’s how you hook em up and the rhyme style troop.” = a Hip-Hop mantra. “D.W.Y.C.K.” – this rocked the summer of 1992 and was “Take It Personal’s” b-side. It wouldn’t appear on an album until ’94’s Daily Operation. “Gotta Get Over (Taking Loot)” – this gem is from the Trespass Soundrack (1993). “Loungin'” f/ Donald Byrd – recognize, Donald Byrd has BEATS. “Le Bien, Le Mal” – that would be featuring MC Solaar. not the guy who calls himself superproducer with no hits to his name. “Mass Appeal” – Premier is cutting up “Pass the Mic” by Da Youngstaz, in case you didn’t know. “Royalty” f/ K-Ci & JoJo – the record everyone looked at on paper and said “WTF” but still sounds great. “Keep Your Worries” f/ Angie Stone – that’s DJ Scratch in the video. Also, my fav track on this album was “Certified” featuring Bilal and produced by Jay Dee/J. Dilla. Guru’s nephew Justin Elam reveals some disturbing details, if true, about the Gang Starr MCs relationship with his business partner Super-producer Solar. Reading in between the lines of recent Guru interviews seems to at least confirm that something is “off.” Can’t wait to get Solar’s side of this story but keeping information from someone’s family is tough to justify. Regardless, keep praying for Guru’s health. Would have been nice if Nas made that album with Premier like he promised in the above mag. About a year ago I was at some random event where Premier was in attendance and I asked Guru’s “associate” what happened with said album. I’ll keep it off the record as promised, but he was none too happy. Well, Nas has other issues to deal with. Let me up something I had in the files; a Nas freestyle from the Stretch Armstrong & Bobbito Show circa 1990-fresh. Below, that white guy who used to drop the N bombs’ “Back to Grill” video. Most people nowadays will know Kool & the Gang for their Pop/Crossover hits like “Celebrate” and “Ladies Night” That’s all well and good but if you’re a little savvier with your music history you will note that Kool & the Gang started with traditional Jazz leanings before delving knee deep into R&B and Funk before getting their Disco on. Being that the group’s main players—brothers Robert “Kool” Bell (bass) and Ronald Bell (tenor sax) as well as George Brown (drums), Robert Mickens (trumpet), Dennis Thomas (alto sax), Charles Smith (guitar, RIP) and Rick Westfield (keys)—were all accomplished musicians, it’s no wonder their catalog has been picked clean by scavenging Hip-Hop producers. The song in question here (directly below), “Summer Madness,” stems from their R&B/Funk days, though they retained their sophisticated Jazz sensibilities. The instrumental tracks sweeping synthesizer and haunting melody was first heard on Kool & The Gang’s Light of Worlds (De-Lite, 1974) album. That said, I wanted to share some of my fav “Summer Madness” flips, for the uninitiated. No one tell Premo I dropped dime please, thanks. “Summer Madness” forms the musical landscape for Premier to cut, scratch and transform with finesse, and all that mess. Word to Biz Markie and Cool V.
Ahh, feel the wave; when Jones and Max were best of buddies and making surprisingly good music. Pete Rock chops up “Summer Madness’” synth to the point where they’re almost recognizable, Max drops a catchy hook and Jones fills in adequately on the rhymes. You really can’t lose early Mos Def teaming with late 90’s, underground Hip-Hop torchbearers teaming up over a Posdnous (De La Soul-did I really have to add that detail?) produced track. Enough of a classic that younger heads will think it’s the original. *I’ll get around to posting that Spinna story from the late, great Scratch Magazine, one day.